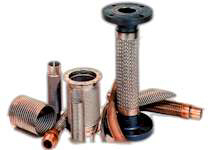 FLEXIBLE ENGINEERED HOSE - The Ideal Accessory for Piping Systems. Designed and manufactured to absorb lateral, angular and vibration motion in gas or liquid piping systems. When designing flexible systems, it is necessary to understand the diffferent ways to relieve thermal forces in piping systems. PISAFLEX offers a complete line of expansion joints and flexible hose. Manufactured in Stainless Steel, Nickel & Chrome and other materials. Manufactured in Stainless Steel to correct piping problems such as extreme temperatures, misalignment, thermal movements, vacuum and others.